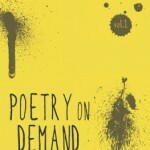 What is Poetry On Demand? 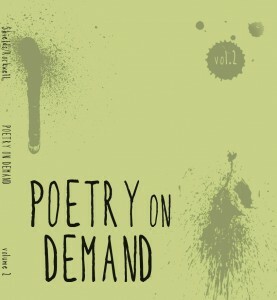 Created by Vanessa Shields (me), Poetry On Demand is live poetry making for the masses. It combines word associations from YOU and the creative mind of the POET on demand (Vanessa Shields or any other poet who’s working with her). In less than ten minutes you get YOUR VERY OWN POEM made especially with and for YOU. The poem is made with your help as you will choose three words from a basket, make associations to these words, then leave the rest in the capable, inspired hands of the poet. You will receive the hand-written, signed and dated poem to keep forever and ever. This is a revolution in the world of poetry – brought to you in a fun, accessible, creative way. 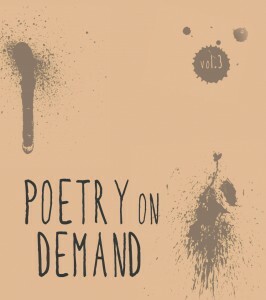 How does Poetry On Demand work? It’s simple. For each word, you think of another. Example: you choose HEAT. Then I say: What do you think of when I say the word HEAT? And you say: SUN. Or LOVE. Or SNUGGLING. Or PHOTOSYNTHESIS. Honestly, any old word will do. When we’re done our INTERACTIVE WORD CHOOSING AND ASSOCIATION, I have six (6) words that I have to use in a poem THAT I WRITE IN 3 – 5 MINUTES. Wait, what?Yeah. I wrote that. I write you a poem using words that YOU just gave me. And I do it in less time it takes you to…um…pee or get a snack. Since I’ve been doing this for years, I’ve collected quite a few poems on demand. In fact, I’ve self-published FOUR VOLUMES OF THEM. I promise you’ll change your tune about poetry…unless it’s already along the lines of ‘I LOOOOOVVVVEEE ITTTTT!’. Let’s let poetry live in our lives like our favourite foods. Words are ingredients. Let poetry be your meal. And the poet is your chef. Listen up to my doing live Poetry On Demand on CBC Radio with CBC Windsor Morning host Tony Doucette! Vanessa does Poetry On Demand on the radio! If you would like to hire me for an event, I can easily create words for Poetry On Demand to suit your event. Ex. If you’d like me to write love poems at your wedding, I can certainly do so. 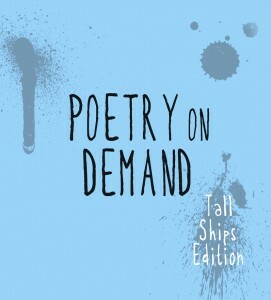 Poetry on Demand is now on Facebook! Contact me via Facebook and I will write you a poem there!